Primary Inspired: I Made It Monday! ~~ Labels & a Freebie! I Made It Monday! ~~ Labels & a Freebie! 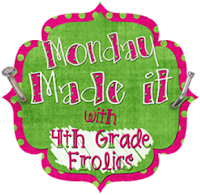 I'm linking up with 4th Grade Frolics for her first ever ""Monday Made It Linky Party! SO-- those who know me know I'm all about changing it up in my classroom...always rearranging and changing it up. This summer I'm working on changing my color scheme. After reading Debbie Diller's Spaces & Places a couple years ago, I always strive to get a color scheme that ties everything together, arrange my furniture so that the room looks as open as possible, and generally create a calm, inviting environment. My inspiration piece is this awesome hanging book shelf that I won from Pen Pals & Picture Books. LOVE it! I love how it's such a space saver in the classroom...and I LOVE the colors! I already have lots of blue in the room as well as a couple pieces of red. I finally came up with a color palette that takes into account not only my inspiration piece, but also the other *non-negotiable* pieces I have in my room. Lovin' it so far! Working on it bit by bit throughout the summer. Today, I made new labels. 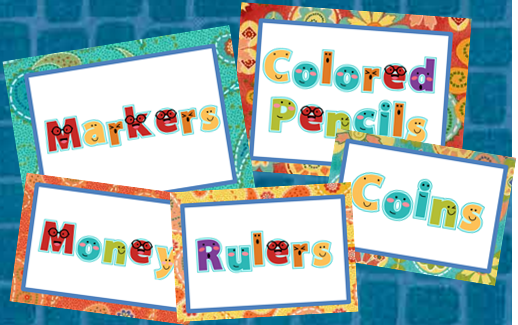 I paired paisley in my color palette & used the Pop School Alphabet on Lettering Delights (FREE Try Me right now, too!). I'm showing them on blue because that's the color most of the tubs are that the labels are going on. I am so excited to be making these changes to my room! I'll be working on it little by little over the summer....but we go back on August 2nd, so I don't have TOO much time! If you'd like to use these paisley labels, just click the picture of the labels. 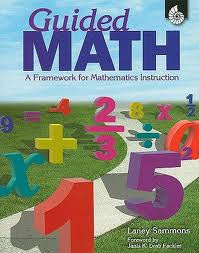 Don't forget to check out the Guided Math Book Study! How can I meet the needs of ALL my students during math block, then this is for you! And I'm giving away a copy of the book! Find out how you could win HERE. Hi Brenda! Thanks for linking up:) Love your new color scheme...there are so many awesome digital papers out there with the red and turq. :) Super sharp:) Your labels turned out just adorable! I need to make new book bin labels and keep forgetting!!! What a terrific freebie! I love Lettering Delights' stuff! And thank YOU so much!! I absolutely LOVE it! You can see it's become the inspiration piece for my room! Thanks so much for sharing them, so pretty!